Until today the Danish manufacturer Fritz Hansen produces the "Egg Chair" or "The Egg" - a legendary lounge chair, the designer Arne Jacobsen designed already in 1958 for the Royal Hotel in Copenhagen virtually unchanged. The curved chair with its flowing forms was a pleasant contrast to the hotel building, the clear straight lines of the architecture of the building at those times already. After a long design work on the perfect shape of the furniture, (the legend says that Jacobsen formed the model of the Egg Chair from clay in his garage over a long period, he then took a completely new material and created the core of the chair as a stable shell of cold foam. With its unique shape, which conveys a feeling of security to the seated person himself even in highly frequented environments, the Egg Chair is suitable both for use in public buildings, in the lounge or in the waiting area, as well as for private homes. The Egg is available in a variety of fabrics and with different qualities of leather, of which we present on this page just a few. We provide every possible variant, do not hesitate to contact us. 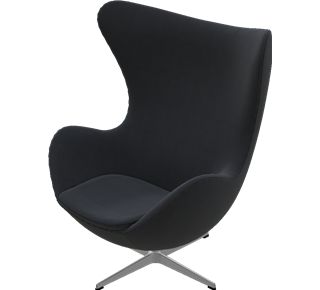 Related links to "Fritz Hansen Egg Chair"
Customer evaluation for "Fritz Hansen Egg Chair"